Students play an interview bingo style game using the continuous form of the present perfect. The verbs used are play, like, study, and live. Q: Do you play soccer ? A:Yes, I have played soccer for 2 years. / No, I don’t. The verbs covered are: play, like, study, and live. Hand out the worksheet and go over the example dialog at the top of the sheet with the students. Have the students fill in the past participles of the verbs under 復習 to make sure they will know how to ask the questions if they are a bit rusty. 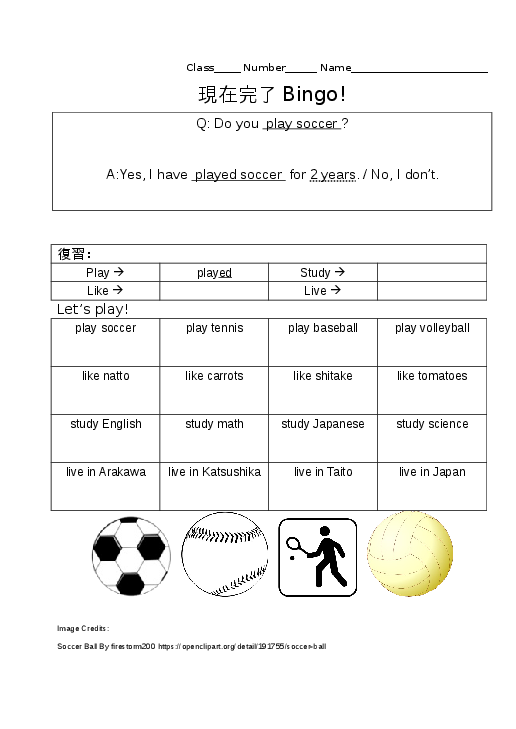 Have the students perform the dialog with each other in order to play bingo. When a student answers “yes” have the other student write down that student's name in the corresponding box. Students who get 4 in a row win. In order to make the students actually communicate with the dialog, instead of writing down their friends' names, have the students write down the number of years their friends have been doing something. Make a bigger number of years correspond to a higher score on the bingo sheet. If you have kids that have a hard time reading, it's best to read over all the spaces in the bingo sheet to make sure they understand them.